A brief statement about your household: I am married with 3 children and a 6 year old grandson. What is your crafty style and expertise: I love scrapbooking and photography. My style is eclectic, and I love combining different elements on my projects. How long have you been stamping: I actually started stamping (card maker) then scrapbooking next, it's been more than 10 years now! Where do you draw your design inspiration from: There's the magazines, books, and online galleries. It's really everywhere! Other design teams: Imaginisce, Clear Scraps, and Quick Quotes. One random/fun fact about you: I am a book keeper five days a week. 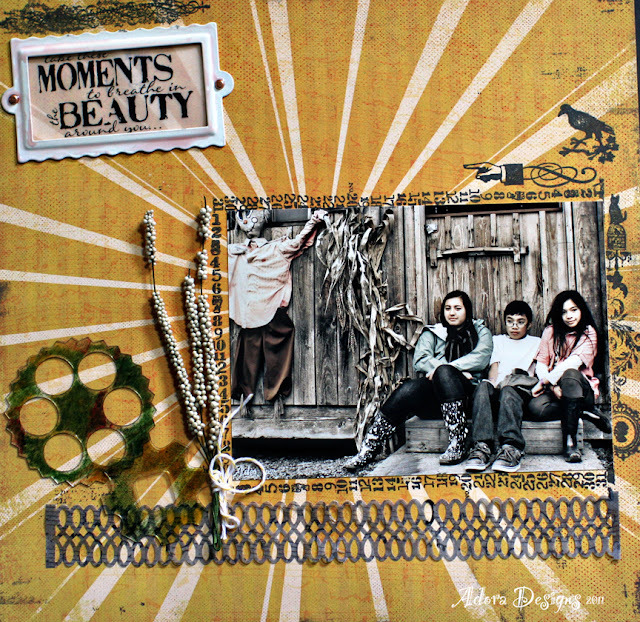 What a gorgeous layout with rich color, and the perfect touch of stamping! This stamp, and card just makes us smile! Great work Adora! What a stunning piece! Adora really has a gift for putting together a beautiful work of art! Head on over to Adora's blog www.adoraconcepcion.blogspot.com to see even more of her beautiful work!!! Once again, we are so very proud to announce our first ever design team and we think we've got some pretty great gals! Check back Monday when we start showing off some of their amazing projects that you can learn how to make too!